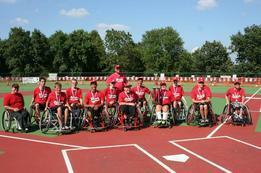 For the past sixteen years, the Nebraska Barons adult team has been the nation's top-ranked wheelchair softball team. The adult team has won twelve of the past sixteen Wheelchair Softball World Series making them the best wheelchair softball team in the 43 year history of the National Wheelchair Softball Association (NWSA). The team currently features six active players already inducted into NWSA's Wheelchair Softball Hall of Fame. Several Barons' players also have significant athletic accomplishments in other adaptive sports including basketball, tennis, sled (ice) hockey, track & field, wheelchair racing, and wheelchair rugby. There are also Paralympic medalists on the team as well as a former minor league baseball player and another player who was drafted by Major League Baseball. The Junior Barons won five consecutive Junior World Series titles from 2008 through 2012 and recently finished 3rd in 2018. The Junior Barons feature several accomplished female players who excel in other adaptive sports (like basketball and track & field) In 2011 several players were members of the national champion 2011 National Wheelchair Basketball Association Varsity division team. The Nebraska Barons wheelchair softball teams make their home at Nebraska Barons Field at AllPlay Complex. After 20+ years practicing and playing in parking lots, the Barons now practice and play on the nations finest wheelchair softball field. The specifically designed field allows the players to maximize their abilities and play wheelchair softball to their maximum potential. The Barons compete in the National Wheelchair Softball Association (NWSA) against several Major League Baseball sponsored teams from Chicago, Boston, Minneapolis, Cleveland, New York, San Francisco, and Tampa Bay. While those teams have the advantages of funding and population, the Barons have used a Midwestern formula of hard work, diligent preparation, all-out-effort, teamwork, and the new Barons field at AllPlay Complex to bring multiple national championships home to Nebraska. The Barons come from all walks of life and professional accomplishment including doctors, lawyers, professors, business professionals, computer programmers, former professional baseball players, production line workers, and students. Their disabilities include amputation, spinal cord injuries, cerebral palsy, spinal bifida, and other birth defect and trauma injuries. 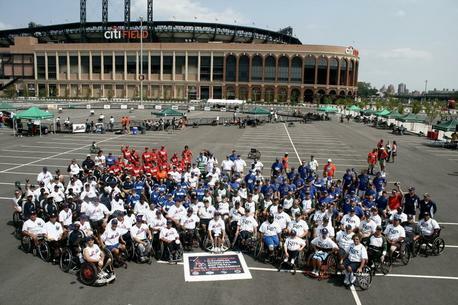 Men and women of all ages can compete in wheelchair softball as long as they have a disability affecting their mobility. For over 43 years, the National Wheelchair Softball Association (NWSA) has promoted and developed the game of wheelchair softball for adults with disabilities. Thousands of disabled athletes from across the country have benefited from the ability to participate in a game that is considered America's greatest pastime. These individuals needed to develop a way of playing without the full use of their legs that would allow easy maneuverability in a wheelchair and keep the fast pace of softball. Thus was born a new game played on hard surfaces, such as a parking lot or one of the ten dedicated wheelchair softball fields through out the country, instead of the normal grassy infield, allowing players maximum speed and maneuverability, A larger 16-inch softball is used (14 inch is used in the junior division) which allows wheelchair players catch hit and thrown balls without gloves. 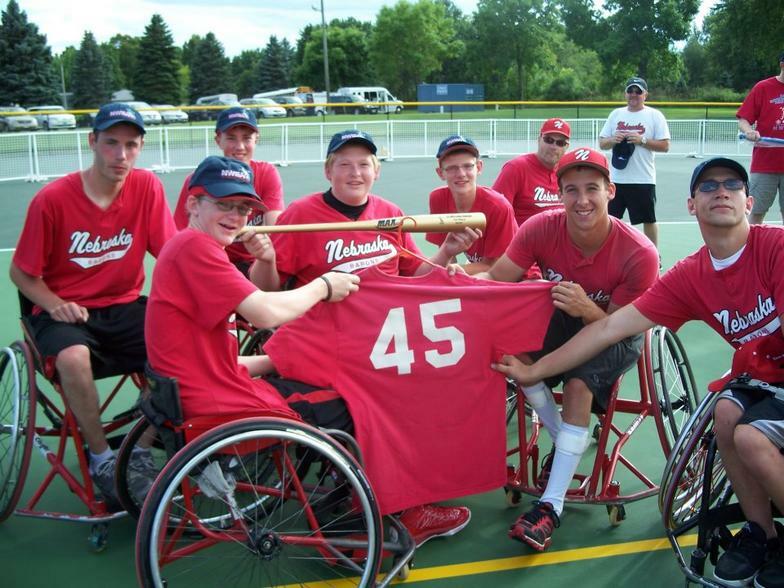 Founded In 1976, NWSA serves as the governing body for wheelchair softball in the United States. The game is played under the official rules of the 16-inch slow pitch softball as approved by the Amateur Softball Association of America with some exceptions geared toward the wheelchair user. Teams throughout America practice on regular basis and compete in tournaments throughout the summer. NWSA hosts a national wheelchair softball championship tournament annually, which celebrated its 35th anniversary in Omaha, NE at ALLPLAY Complex this past August. Today, NWSA governs over 40 teams worldwide. Many teams have sought and found allegiance and sponsorship with their Major League Baseball (MLB) team counterparts, such as the Boston Red Sox, Chicago Cubs, Colorado Rockies, Minnesota Twins, New York Mets, Philadelphia Phillies, and Tampa Rays. Many wear official MLB uniforms and compete with pride under their respective professional team's logo. NWSA also has a junior division of wheelchair softball for youth. The junior division was established by NWSA specifically to provide an opportunity for disabled youths to enjoy the thrills and experiences of America's pastime. As a result of their disabilities many children are left out of experiencing the joys provided by competitive athletics. But just like their classmates in school who play in YMCA and other competitive leagues, youth with disabilities should have the opportunity to experience and joys, sense of belonging to a team, health benefits, and all the life lessons provided by playing athletics.